There must be some truth to the old saying “everyone loves a man in uniform.” That’s what Navy vet Jerry Schuld was wearing when high schooler Peggy first met him, and 60 years later, the couple is still happily together. The secret to their lasting union? 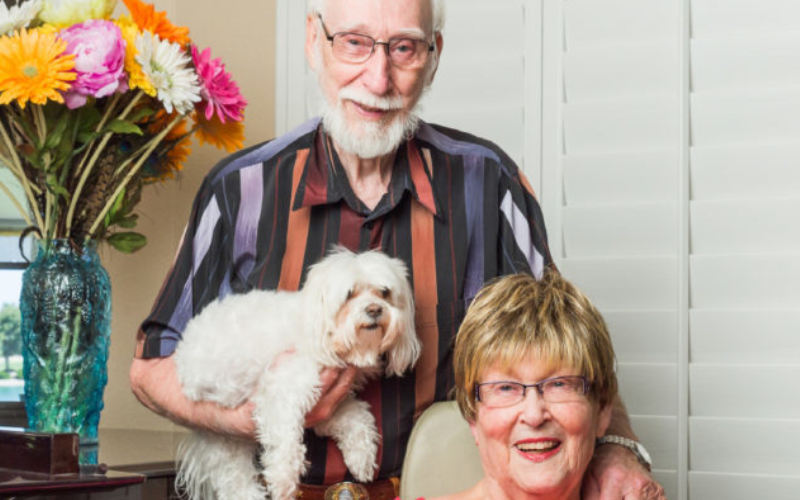 For the past six decades, the couple has remained not only devoted to each other, but to their two daughters, grandchildren, their faith, the arts, veterans and supporting community health and wellness through the Sun Health Foundation. The Schulds marked their 60th wedding anniversary in May. It seemed destined that they should meet. Jerry was a young Navy veteran, home from serving in the Korean War and searching for the next chapter in life. Without a specific plan, he began looking for a job at the convent where he had spent summers working as a teen. Peggy happened to be a high school student there. They met while riding the school bus. Dressed in his Navy uniform, Jerry was taking a ride to decide whether he wanted to be a bus driver. “You can imagine a sailor on a bus with about 30 girls,” Jerry says with a laugh. Peggy ultimately asked Jerry to the prom. The dance sealed the deal for the couple. The Schulds, Illinois transplants, have called Sun City West home for 30 years. Intrigued by a movie about the Sun City communities, they decided to come explore a bit – in sweltering July. “I figured if we could stand it for our vacation, we could settle here,” Peggy recalls. They settled into desert life, found a church home and became a part of the community. Peggy, who previously enjoyed doing needlepoint, discovered a passion for painting and became active with art clubs. Jerry, raised on a dairy farm with little exposure to the arts, became an arts supporter along with his wife. He also got involved with an organization that assists veterans in need. Jerry and Peggy decided to support health and wellness in their community with an initial donation to what is now the Banner Del E. Webb Medical Center. Their support grew through Sun Health Foundation.